A week or so ago, a troll left a link at my blog (Thanks, David) to a supposed-to-be-alarming blog post about a new climate study of ocean heat content. According to the study, a revised method of tweaking ocean heat reconstructions has manufactured new warming so that the top 700 meters of the oceans are warming faster than predicted by climate models. In other words, the “missing heat” is missing no more. John Abraham, alarmist extraordinaire from SkepticalScience and The Guardian’s blog ClimateConsensus, was a coauthor. See Abraham’s post The oceans are warming faster than climate models predicted. Can anyone guess the goal of their study from the title of Abraham’s post? John Abraham isn't from SkepticalScience.com. He's Professor of Thermal Sciences in the School of Engineering, University of St. Thomas, St. Paul, Minnesota. And I doubt that anyone at WUWT would guess the goal of the study from the title of the Guardian article. (That title was about the findings, not the objectives.) Or from Bob's article for that matter. Like Bob Tisdale, WUWT readers are conspiracy theorists and they would have "guessed" something different to the real reason for the study - which was to improve the record of ocean heat content and work out what still needs to be done. Systematic bias of the temperature measurements such as Expendable BathyThermographs (XBT) (Abraham et al. 2012a, 2012b; Cheng et al. 2014; Gouretski and Koltermann 2007; Gouretski and Reseghetti 2010; Levitus et al. 2009) and Mechanical Bathythermographs (MBT) (Ishii and Kimoto 2009). Insufficient coverage of in-situ ocean temperature observations, in both horizontal and vertical dimensions (Cheng and Zhu 2014a, 2014b; Lyman and Johnson 2008). Choice of key methodologies such as climatology (Cheng and Zhu 2015; Lyman and Johnson 2013). Quality control of the in-situ data. The accuracy of OHC estimation relies on proper treatments of the four issues listed above. In this paper, we will briefly discuss these error sources and review the recent progress of solving them. Based on the proper solutions to those errors, a new assessment on historical upper 0-700m OHC change can be achieved. However, we note that we do not mean that this estimate is the best one compared with previous estimates, because challenges still remain during OHC calculation. The challenges will require more detailed studies in the future. But how would you measure the ocean? How would you make consistent, long-term measurements that would allow people to compare ocean heat from decades ago to today? How would you make enough measurements throughout the ocean so that we have a true global picture? This is one of the most challenging problems in climate science, and one that my colleagues and I are working hard on. We look throughout measurement history; first measurements were made with canvas buckets, then insulated buckets, and other more progressively complex devices. Many measurements were made along ocean passageways as ships transported goods across the planet. As more ship travel occurred, and more measurements were made, the coverage of temperature measurements across the globe increased. So, over time, we say the temporal and spatial resolution increased. As these changes occurred, you have to be careful that any trend you see isn’t just an artifact of the resolution or the instrument accuracy. Note his dog-whistles again - "manufacture", "adjusted", "tweaked", "modified", "tortured". Bob doesn't have a clue what the researchers did but he does know the words to get deniers all worked up in a lather of conspiracy theorising. ...a collection of ocean temperature and salinity profiles obtained across the global oceans over the period 1900 to present to which a series of quality control checks have been applied. Associated with this are monthly objective analyses with uncertainty estimates. Figure 2. a). Estimation on historical ocean heat content change (represented by 0-700m averaged temperature anomaly in unit of oC) from 1970 to 2014 (red). The red dashed lines and the yellow shades represent the spread of the 50 calculations by using 60% randomly selected grids each time. By the way, Cheng15 didn't use EN4. They used pretty much the same source data as EN4 for temperature profiles though. But the trends listed on the graph are so minute, shown in ten-thousandths of a degree C per year, they’re likely losing some of their audience with all of those zeroes. Bob Tisdale is a conspiracy theorist as you probably know. He accuses anyone and everyone of "fudging" data - that's criteria number 1 of conspiracist ideation - "nefarious intent". What you'll find however, is that Bob doesn't mention the process by which the global reconstruction was put together. If he's aware of it he hides it well. Given that he seems to think that it's not necessary to grid-average or map the temperature profiles, he's probably not aware of what's wrong with his article (not just his conspiracy theorising, but his basic premises). I don't know where Bob got his "doubled" from. Could he have worked it out using degree Celsius? Surely not. What number would he have got if he'd used Fahrenheit? [Sou: Silly me. The answer would be the same. That wasn't the problem as Alexander Coulter points out in the comments.] Anyway, the researchers themselves said using NODC-mapping was around 20% lower then their mapping method. They worked it out using joules/year. The existing estimates of historical OHC change by different groups show a substantial divergence and reveal uncertainties in its value. For instance, Intergovernmental Panel on Climate Change Fifth Assessment Report (IPCC-AR5) (Rhein et al. 2013) provided five independent estimates of historical OHC change from 1970 to 2010 by five different international groups: 74PW(Smith and Murphy 2007), 98PW(Ishii and Kimoto 2009), 108PW(Palmer et al. 2007), 118PW (Levitus et al. 2012), and 137PW(Domingues et al. 2008). Among these values, the minimum is as much as a half of the maximum, implying a large divergence of ocean warming rate assessment. In previous parts of this study, a new assessment on historical OHC is obtained using a new methodology. It is not clear that this is the best estimate of OHC because there are still some major challenges in OHC calculation. One of the major remaining challenges is how to infill the OHC data gaps, which requires the choice of mapping methods. 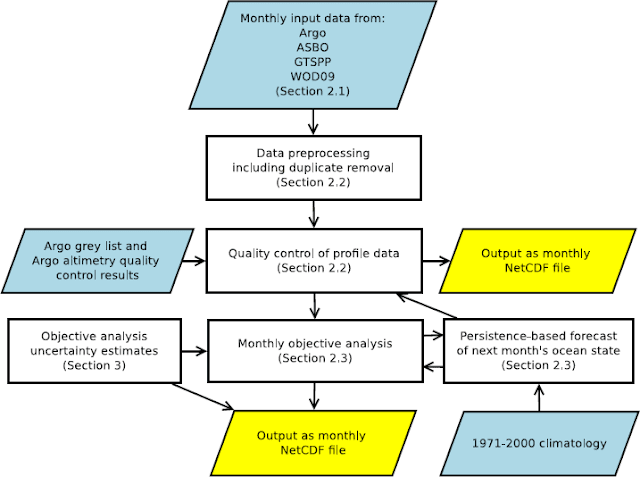 Figure 4 provides the OHC time series calculated by applying NODC-mapping, where an objectively interpolation method is used to fill the data gaps. NODC-mapping results in (0.42±0.10)×1022 J/yr OHC trend, ~20% smaller than our estimate. The discrepancy suggests that a comprehensive examination on the existing mapping methods is required to understand their performances, and then to identify an optimal method. Below is Figure 4 from the paper, which compares the method used in this study (red line in a) with results using the NODC-mapping method (blue line in a) as well as results from CMIP5 climate models (grey in a). Figure 4. a). Upper 0-700m ocean heat content calculated by using 40 CMIP5 models (historical run) in grey, with ensemble mean shown in black. CMIP5 results are compared with the observation-based estimate by using the strategies presented in this study in red, by using NODC-mapping shown in dashed blue. The two major volcanoes are marked by black arrow. Alternatively, Cheng and Zhu 2014b proposed a simple method by dividing the global ocean into a Ship Area (with sufficient data coverage in the past 45 years) and an Argo-Ship Area (with sufficient data coverage only since Argo Era). The yearly mean OHC in the Ship Area can be directly calculated based on the available observations. However, in the Argo-Ship Area, because of the insufficient data, inter-annual ocean variability cannot be well represented, instead, only a linear long-term OHC trend is calculated. Therefore, the global-mean OHC is calculated by combining the OHC estimates in Ship Area and the obtained linear trend in Argo-Ship Area. By using this strategy, the long-term trend of global OHC can be estimated. Seems to me that while Bob Tisdale is happy to average temperature profiles only, regardless of where those profiles are and the sources of data, the scientists themselves are a lot more fussy and meticulous. They are also much less certain about the best approach. Rather than throw their hands in the air and wail "it's all too hard", they continue to work to improve the information, and identify where more work is needed. As expected, the WUWT-ers uncritically accept Bob's conspiracy theory and some elaborate on it. All they want is someone to tell them it's not warming, or if it is it's not humans, or if it is it's not bad, or if it is there's nothing to be done. markstoval loves a good conspiracy. He comes across as a right wing authoritarian follower with his distrust of "government". He foolishly takes at face value Bob's comment about "models".. Bob doesn't understand climate models. He thinks they are weather forecasts. And he doesn't tell his readers what the paper itself says or what the researchers have done. “Once again, the climate science community has shown, when the models perform poorly, they won’t question the science behind the models, they are more than happy to manufacture warming by adjusting the data to meet or exceed the warming rate of the models. The theory behind CAGW (or climate weirding or whatever) has failed. The models have failed. The predictions have failed. Only fiddling with the data partially hides these facts. Thanks for the continued vigilance Bob. In a discussion with a friend about sea temps, I asked him how many thermometers he thought he’d need to accurately measure the temp of an olympic sized pool. When he came up with a double digit figure, I pointed out how much bigger the worlds oceans are and how few thermometers were measuring down to 700m. His faith in his ability to claim that the oceans are warming was somewhat shaken. According to your Figure 4, the standard for “observational sampling coverage” is met if you sample a 1 degree bin area once per year. Once per year? I wonder whether there is a difference in trends that result from using only rarely sampled sites vs only using frequently sampled ones? I suppose you also might have to control for latitude, season, etc. but that would just call the value of once-per-year data into question even more. Have you posted a comparison of temp (or heat content) trends comparing once-per-year sample areas to areas that have more frequently gathered data? What kind of lab equipment and process would it take to measure the temperature of a glass of water to this precision? I find the whole idea that they can measure “the effect of CO2″ in the deep oceans frankly laughable. Even assuming there is a mechanism by which this effect can be distributed there, the changes in temperature would be impossibly small to measure. Sounds like climate change articles need to include an MGM style disclaimer. All temperatures used in this study are completely fictitious. Resemblance to the actual temperature at any location, past or present, is purely coincidental. This study was based on real data. The numbers have been changed to protect the climate models. That's enough of that. The comments are more of the same. Scientists all have nefarious intent and are out to hoodwink deniers. Deniers are too canny to be fooled. They just know that the past 200 years of science is a hoax. The oceans are warming faster than climate models predicted - article by John Abraham at The Guardian. Well done. Looking at WUWT gives one mixed feelings of schadenfreude and fall on floor laughing at the stupidity. "I don't know where Bob got his "doubled" from." He's roughly dividing 0.0061 by 0.0033; that ratio doesn't change if the units change. However, he should also probably know that the trend in the paper is from 1970 to 2014, and the trend he calculated was until 2005. The NODC 0-700m temperature trend over the period until 2014 is 0.003929, so the difference between that and the Cheng et al. value is an increase of about 55%, not 100% as he suggests. 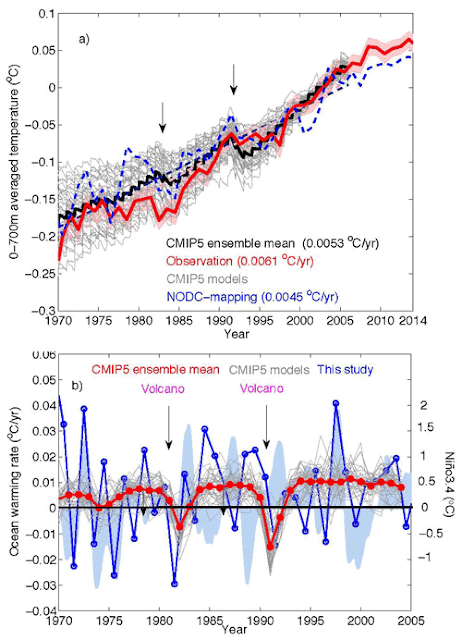 What I find interesting from their paper is that they say, with respect to Figure 2, that there is multi-decadal variation in ocean heat content rate judging from the changes in the 9-year rate. But that is almost certainly due to their choice of filter; when you take moving derivatives you change the frequency spectrum for the new data. The derivative series amplifies certain frequencies and dampens others as a bandpass filter. As it were, this choice of filter amplifies periods from 7.8 years to 41.7 years, with a peak at 13 years. So it's not much a wonder why that variation—a roughly 15 year cycle—exists in the 9-year data. Maybe "power spectrum" would be a better term here. The power given in a periodogram for those periods is amplified. that what is available there (and what Tisdale used) is not what Cheng et al. made with the "NODC-mapping". I'm not sure exactly what that is, but either way the two series are visually very different from each other. You'd think Tisdale might want to ask for clarification on the differences between the NODC-mapping used by Cheng et al., and whatever was used for the publicly available data. 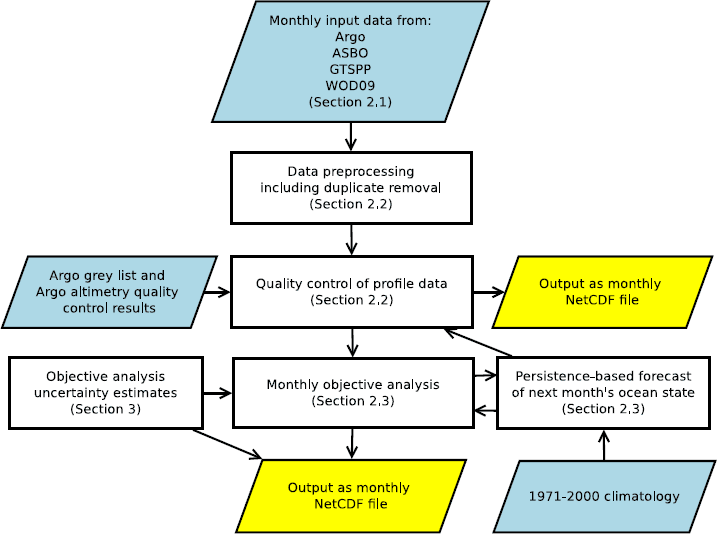 As in: does "NODC-mapping" actually mean the exact method as used for the publicly available data, or no? Are the authors using an updated method that hasn't made its way into the publicly available data? Is the public data more updated? It would seem to me to not be useful to yet compare those trends. I haven't checked, but AFAIK presenting their main result with "NOCD-mapping" result was solely to show how the choice of mapping made a difference to the result, so they used the same data throughout. NODC may well use a (slightly) different set of base data, different QC, different gridding etc so this result and NODC would not be expected to be identical. "that ratio doesn't change if the units change" - you're right of course Alexander. I wasn't thinking. The SkS article was a repost from The Guardian. The SkS team is listed here. John Abraham isn't part of the Skeptical Science team. >>"good luck with the rest of your hatchet attack on Tisdale..."